For other uses, see Servia (disambiguation). Servia (Greek: Σέρβια, Sérvia) is one of the main towns in the Kozani regional unit, West Macedonia, Greece. It is one of the most historical places in the region, with a 6th-century Byzantine castle and the Kamvounia mountain dominating the landscape. There are also a number of 10th century Byzantine cave hermitages and small churches located nearby, which add to the Byzantine atmosphere of the area. Since the local government reform of 2011, it is the seat of the extended municipality of Servia-Velventos. Prior to 2011, the town was the seat of the Municipality of Servia (population 8,611 in 2011). 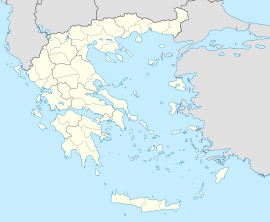 Τhe town itself has a population of 3,540 people (2011 census). The municipal unit Servia has an area of 400.116 km2, the community (the town proper) has an area of 51.603 km2. Its name derives from the Latin verb servo, meaning "to watch over" and it was given by the Romans, approximately during the 2nd century A.D., replacing what is thought to be the ancient name of the town Phylacae (Greek: Φυλακαί) from the Greek verb φυλάσσω "to watch over". The ancient name of the town of Servia is also mentioned by Roman writer Pliny the Elder as well as on an Ancient Greek inscription found at the city of Veroia which reads: "Παρμενίων Γλαυκία Φυλακήσιος νικητής εν Δολίχω", i.e. "Parmenion son of Glauceas from Phylacae winner at Doliche". Servia has given its name to the prehistoric settlement site beside the former bridge across the Haliakmon river to the west and now submerged deep below the surface of Lake Polyphytos. This was first reported by Alan John Bayard Wace and first excavated by the British School at Athens under the direction of Walter Heurtley in 1930. Renewed excavations were jointly conducted by the Greek Archaeological Service and the British School at Athens under the direction of Aikaterina Rhomiopoulou and Cressida Ridley between 1971 and 1973; in advance before the completion of the Polyphytos hydro-electric dam and the flooding of the valley, to create Polyphytos lake. The site is a low mound created by the debris of successive phases of human occupation, starting in the Middle Neolithic period before 5000 BCE. The square or rectangular buildings, one or two storeys in height, were framed with massive oak posts and the walls were created with wattle and daub. The 'classic' red on cream ceramic repertoire of this phase is closely related to that of Thessaly at such sites as Sesklo and Achilleion. Typical shapes are fruitstands, shallow bowls and beakers. Bone and stone tools are frequent while ornaments of stone and sea shell (Spondylus gaederopus and Glycimeris) are quite frequent. Occupation continued for a thousand years until the early stages of the Late Neolithic period, characterised by black burnished and grey-on-grey pottery. Occasional fragments of pottery of other styles, together with occasional pieces of obsidian from Melos show that long distance 'trade' links had been established with coastal Thessaly and Eastern Macedonia. After a long interval, occupation resumed in the Early Bronze Age (3rd millennium BC)when the ceramic repertoire suggests a cultural orientation towards Central Macedonia rather than Thessaly. Palaeobotanical studies of seeds and other plant remains recovered from all periods at the site and studied by R. Housely and R. Hubbard provide important information about early Greek agricultural practices. The Town Hall of the city of Servia. During ancient times, Servia served as a fort for the passageway between Macedonia and Thessaly, hence its name. As time passed people settled around the area and the town of Phylacae was created. People that have passed through the then town of Servia, include Alexander the Great, on his way to Thebes in 335 B.C., and Apostle Paul during his journey to Macedonia in the first century A.D.
Servia reached its peak as part of the Eastern Roman Empire when it developed as a strong castle-city (Greek: καστροπολιτεία) guarding the ancient passage from Macedonia to Thessaly. The Ottomans captured Servia in 1393. From 1864 it was the seat of the Sanjak of Serfiğe in Manastir Vilayet and the town was known as Serfiçe in Ottoman Turkish (also written Serfidze). Servia was the seat of the Bishop of Servia and Kozani until 1745; after that year the seat was moved to Kozani. The bridge of lake Polyphytos near Servia; the Pieria mountains can be seen in the background. The Greek army entered Servia on 10 October 1912, during the First Balkan War, after its victory against the Ottoman army in the Battle of Sarantaporo. On the same day, 117 prominent citizens of Servia were gathered and executed by the Ottomans who were leaving the city. From then on the main road of the town leading to the Town Hall is called "117 Εθνομαρτύρων" (117 ethnomartyron), i.e. "Of the 117 National martyrs", in remembrance of this dreadful event. Servia was granted to the Kingdom of Greece by the Treaty of Bucharest in 1913. During the Second World War, on 6 March 1943, Italian troops set the town on fire in response to the defeat and capture of an Italian battalion at the Battle of Fardykambos by the Greek Resistance. After this fire the whole town was left in ruins and most of Greek neoclassical architecture was lost apart from 3 houses which remain until today. One of them was turned into the Folk Museum of Servia. Today Servia stands as one of the main towns and agricultural centres of the surrounding region, with its extended Servia-Velventos municipality having a population of 14,830 people (2011 census). Main road access into Servia is provided by Greek National Road 3, which passes through the town and is part of the European route E65, connecting the cities of Florina and Kozani with Larissa. A recent historical event that occurred in Servia, was a holy liturgy, celebrated by Metropolitan Paulos of Servia and Kozani at the 7th century Metropolitan Church of St. Demetrius (now in ruins). The event which took place during the summer of 2008 was the first liturgy at the site after 600 years. On Thursday 28 June 2012, the Ecumenical Patriarch Bartholomew visited Servia taking part in Great Vespers at the Church of Agia Kyriake and afterwards visited the old Basilica of Agios Demetrios and the Byzantine castle-city of Servia. The patron Saint of the town is Agia Kyriake. Byzantine castle built in the 6th century by Justinian. Unfortunately only one of its four towers remain in full as it was bombed by the Germans during World War II. The high bridge of lake Polyphytos. The Noktaria geological formations at the village of Mikrovalto. The Folk Museum of Servia. Various Byzantine cave-churches, most famous of which is the church of Aghios Antonios Kremastos. St. Theodora (13th century), Queen of Epirus. Georgios Kontaris (17th century), Scholar. Eugenios Pateras (19th century), Bishop of Servia and Kozani. Zesses Soteriou (19th century), Revolutionary of the Greek War of Independence. Georgios Zorbas, (1867–1941) the main hero of the novel by Nikos Kazantzakis, "Zorba the Greek". Ioannis Zizioulas (20th century), Theologian and Chairman of the Academy of Athens. A.C. Titan Servion, founded in 1927. The Church of St Georgios at the village of Neraida. Mt. Kamvounia on the South side of Servia. "Noktaria" geological formations at the village of Mikrovalto. The Church of St Georgios at the center of Servia during winter. ^ "Servia". Archived from the original on 31 August 2009. ^ Wardle, Kenneth (19 June 1998). "Obituary: Cressida Ridley - Arts & Entertainment". London: The Independent. Retrieved 16 June 2009. ^ a b "SERVIA". Artsweb.bham.ac.uk. Retrieved 11 April 2009. ^ "The large and varied ceramic repertoire included many complete vessels of the Servia variant of the MN Sesklo style with bold red on". Artsweb.bham.ac.uk. Retrieved 16 June 2009. ^ Flountzis, Antonis (1977). Στρατόπεδα Λάρισας-Τρικάλων: Η γέννηση του αντάρτικου στη Θεσσαλία [Larisa-Trikala Camps: The Birth of the Partisan Movement in Thessaly] (in Greek). Athens: Papazisis. pp. 210–211. OCLC 8624538.